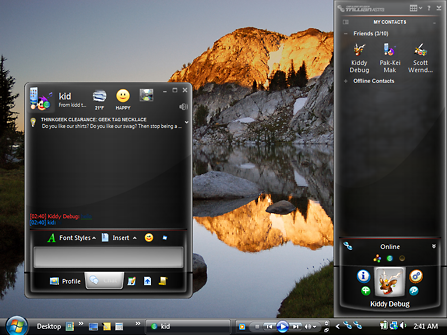 PC users are well aware of Cerulean Studios' excellent Trillian instant messaging client. To the Mac users that haven't heard of Trillian before, it's pretty much the Adium of the PC world. Cerulean has begun development on their next generation client named Trillian Astra. The best part is that it will be available on both PC and Mac. Astra is currently only in the alpha phase of development so don't get too excited just yet. However, I do await its release as it goes far beyond any traditional instant messaging client, if that's even the right word to describe Astra. Unique features include a web-based interface with chat capabilities, RSS news delivered to your IM window, drag-n-drop image sharing in IM windows and file transfer that works (I'm looking at you Adium!). By popular request, Trillian Astra now supports the "buzz" feature of many other IM clients. Buzzing your contact is an incredibly annoying way to quickly get their attention. We apologize in advance for coding this. Initial news of Trillian Astra development broke a few months ago in November. Cerulean Studios revamped a development blog last week for users to keep up to date on all the Astra happenings.